This is the Encore way, come join us, come be part of it. Providing a safe & fun environment for dancers to experience the joy of dance & create lasting friendships. Are you looking to give your child an experience that promotes creativity and friendships? We share your passion for developing your child’s unique gift and allowing their personality to shine through. Whether your child is a tiny tapper, happy hip hopper or a beautiful ballerina our energetic and experienced teachers will help them grow in a creative and caring environment. Your child will be smiling, laughing and creating friendships from the moment they enter the dance rooms. The Encore Experience; where children can be themselves and experience the pure joy that dance can offer. Encore has been in the community for over 25 years. We have time tested and proven programs for preschool/kindergarten, elementary school ages, teenager and we have a wonderful adult program as well.Check us out. Thank you for teaching my two daughters so much more than dance. Not only have they learned tap, jazz, ballet & hip hop from wonderful instructors, they have gained confidence and self esteem in themselves. My family has enjoyed 6 well planned & fun recitals with Encore. I’m excited to start my youngest daughter there this fall. 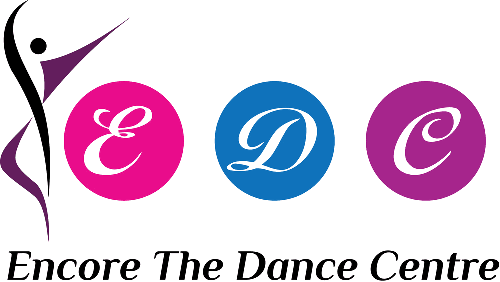 Encore The Dance Centre is so much more than costumes, recitals and steps. Because of the staff and role models at Encore, my children have learned confidence and self esteem. Everyone, from the receptionist to the owner, has always made sure that my children are having fun in everything that they do, be it learning a new dance step to challenging themselves. At Encore, the children have always been put first. I have never had to worry that the choice of music, costume or dance steps would be inappropriate for my girls. I appreciate that the Encore environment is one that is positive, upbeat, and encouraging. After dancing at Encore as a child, I knew there was no better place to take my girls when they started taking dance lessons. Both my daughters and I have continued to call the studio our second home, and it's been such a joy to watch them grow in skill and confidence! The staff is incredibly caring and talented and knows how to bring out the best in all their students. We look forward to many more years of being part of the Encore family! We love being a part of the Encore family. It doesn't matter if your child is on the competition team or dances one class a week to express themselves. Everyone is cherished who walks through the door. We couldn't be happier with choosing Encore for our family!